Suddenly, I miss Baguio. It's probably because I was speaking to my cousin who has lived there since I can remember, and we talked about our favorite hang-outs. We talked about the famous Pandesuelo and the Lechon Rice I used to eat all the time. I think it was his way of coaxing me to go for a visit. Now, I really miss this city. Who could forget Wright Park? My sister and I used to walk here and have picnics. 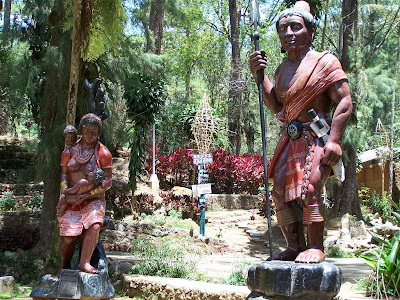 Inside the Baguio Botanical Garden guarded by the noble Igorots. I think I have so many photos taken at "The Mansion." This is Abanao Street getting ready for a busy market day. mordsith, I know. I really should visit. hello kayni. i was there last December. everything looks different now. Wil, Yes, let's do that. 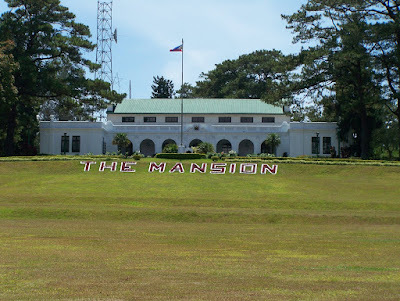 I think it would be wonderful to meet the other Baguio bloggers. Angeli, You're so lucky you can go down there anytime. I'm so jealous. 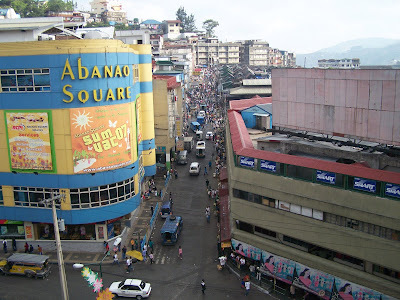 oh i miss baguio too, i'm glad i'll be home this december :) can't wait ... although i must say it's not the Baguio I used to know ;( things have changed and there are just too many people there now!! walking in Session Road is like not the same anymore. toni, i was in baguio two to three years ago, and i was surprised to see so many people. session road was so crowded, and gosh, it used to be fun to go to jollibee because there were seats open, but now you have to wait. I really miss baguio too. The place is jumping... Thanks by the way for dropping by my blog. Hello Emma, I'm glad to see you here. Josiet, You're so lucky you're on vacation at the moment. Sure, there's always a next time. Artemis, I've only seen one Panagbenga. I bet it's getting more colorful and festive each year. 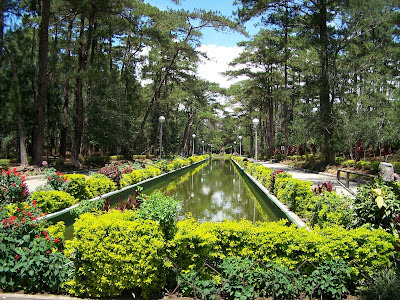 Wits, I do hope you'll visit Baguio on your next vacation too. Hi! My childhood dream of visiting Baguio City has been fulfilled only last month. I was really happy to be able to visit Baguio City though the places we visited were limited due to time constraint. One of those we weren't visited is the Wright Park. But nevertheless, I'm so grateful and definitely plan to visit again in the future.